Facel founder Jean Daninos’ first-generation Facel Vega was unquestionably an automobile steeped in the grand routier tradition, spiritual heir to the prewar greatness of Delage and Delahaye. It was also a commendable effort for a new manufacturer. Intended as a big and brawny Routes Nationale cruiser, not a “turn-on-a-dime” sports car, the car was massively engineered and thus heavy at over 3,700 pounds, but could easily exceed 100 mph. The cabin was lush, with leather trim and an impressive array of instruments and switches as well as fold-down rear seatbacks that provided additional access to the trunk. In fact, Daninos not only sold all he could build (including 11 special convertibles) but actually made a modest profit, setting the stage for a more ambitious effort, the HK500. The HK500 continued on the 105-inch wheelbase of the Facel Vega FVS, so accommodation remained more that of a 2 + 2 coupé than a full four-seater. Still, the new envelope was smarter and more contemporary than the FVS; the HK500 was crisper and more Detroit-inspired, right down to stacked quad headlamps and a fully wrapped windshield with “dogleg” A-pillars. 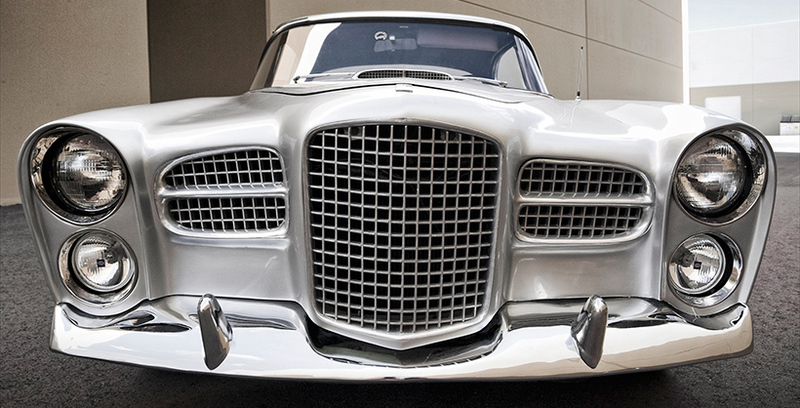 The HK500 also continued Facel’s fondness for Chrysler V-8 power. Later cars featured the American firm’s new 383-cid wedge-head unit, with two four-barrel Carter carburetors that was rated at 360 horsepower. As the HK500 weighed only a little more than the FVS and considerably less than the 1954 model, the bigger Wedge engine gave truly formidable performance. Top speed was at least 140 mph, and the 0-60 mph sprint took place in under 8.5 seconds. Though faster, more stylish and more roadworthy than its predecessor, the HK500 was still mainly a grand touring machine a comfortable, lavishly equipped high-speed cruiser of obvious quality. Built in September of 1960, this Facel Vega HK500 on offer was originally finished in Tudor grey over a red leather interior. The car is powered by the dual-quad 383ci Chrysler Wedge engine and backed by the Pont-a-Mousson 4-speed manual transmission. The car was ordered and delivered at the Facel factory in France for a Mexican client. This client was none other than Emilio Azcarraga Milmo, the owner of Televisa, then the largest television network in Latin America, who intended the car as a wedding present for his niece. When the HK500 arrived in Mexico, ‘Tio [Uncle] Tigre’ unveiled his unique gift. His niece was naturally surprised; however, she was unable to drive a manual transmission. Since it would not have been polite to ask her ‘Tio’ if he could arrange a conversion to an automatic, the car was then sent to the garages at the family’s country club where it continued to receive excellent care in climate-controlled storage. During this period, the car was driven only on a few special occasions around the family estate. The milage is belived to reflect correctly at 9,577, possibly making it the lowest-mileage HK500 in existence. Miles however are unverifiable. One of only 540 built and perhaps the most original HK500 in North America, ownership of this spectacular automobile all but guarantees membership in a very select group of the “few who own the finest”.